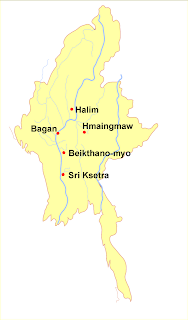 Pyu (also Pyuu or Pyus; in Chinese records Pyao) refers to a collection of city-states and their language found in the central and northern regions of modern-day Burma (Myanmar) from about 100 BCE to 840 CE. The history of the Pyu is known from two main historical sources: the remnants of their civilization found in stone inscriptions (some in Pali, but rendered in the Pyu script, or a Pyu variant of the Gupta script) and the brief accounts of some Chinese travellers and traders, preserved in the Chinese imperial history. The people of Pyu are believed to have been an ethnic group distinct from the Bamar (Burmans), although they may have intermarried with Sino-Tibetan migrants who later became part of the Bamar ethnicity. Chinese historical sources state that the Pyu controlled 18 kingdoms and describe them as a humane and peaceful people, and note the elegance and grace of Pyu life. War was virtually unknown amongst the Pyu, and disputes were often solved through duels by champions or building competitions. They even wore bombax (silk cotton) instead of actual silk so they would not have to kill silkworms. Crime was punished by whippings and jails were unknown, though serious crimes could result in the death penalty. The Pyu were Theravada Buddhism, and all children were educated as novices in the temples from the age of seven until the age of 20. The Pyu city-states never unified into a Pyu kingdom, but the more powerful cities often dominated and called for tribute from the lesser cities. The most powerful city by far was Sri Ksetra, which archaeological evidence indicates was the largest city that has ever been built in Burma. The exact date of its founding is not known, though likely to be prior to a dynastic change in the year 94 that Pyu chronicles speak of. In the 7th century the Pyu shifted their capital northward towards Halingyi in the dry zone, leaving Shri Ksetra as a secondary centre to oversee trade in the south. Sri Ksetra was apparently abandoned around 656 in favour of a more northern capital, though the exact site is not known. Some historians believe it was Halingyi, and may be related to the ancient city of Tagaung. Wherever the new capital was located, it was sacked by the kingdom of Nanzhao in the mid-9th century, ending the Pyu's period of dominance. Ko Aung, thanks for the bit of history. Will check you up often... have a lovely week. I am interested in Pyu race. But I expected that you would state rather complete history. I am often caught up with the thoughts on where those Pyu descendants spread over and which of races living now in Myanmar is the nearest to Pyu. Is it not more than a lost race?